You have arrived in Sydney, both a laid-back beachside town and a thriving metropolis that boasts some of the Southern Hemisphere’s best surf, landmarks and activities. It has a little bit to offer to everyone, be it the sophisticated and iconic opera house, the myriads of beaches like Bondi or Manly, or chic and trendy areas like The Rocks and Darling Harbour; even the Blue Mountain area for nature lovers is just 90 minutes away. Sydney is sprawling, hilly, and a bit cumbersome to navigate by public transport, so it’s definitely not the kind of city where you can easily cover lots of ground by hopping around by train or bus. 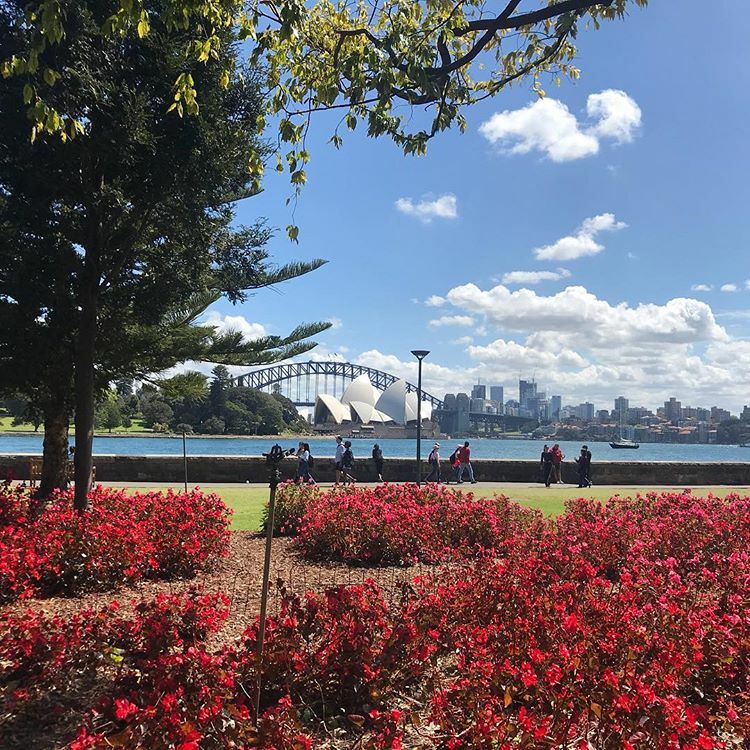 No matter how you plan your time in Sydney, it is strongly recommended that you stick to one or two general areas per day so that you’re not wasting time in transit. Here is our detailed guide on what to do in Sydney in 3 days. After several hours on a plane, some ocean breeze can be a welcomed change. 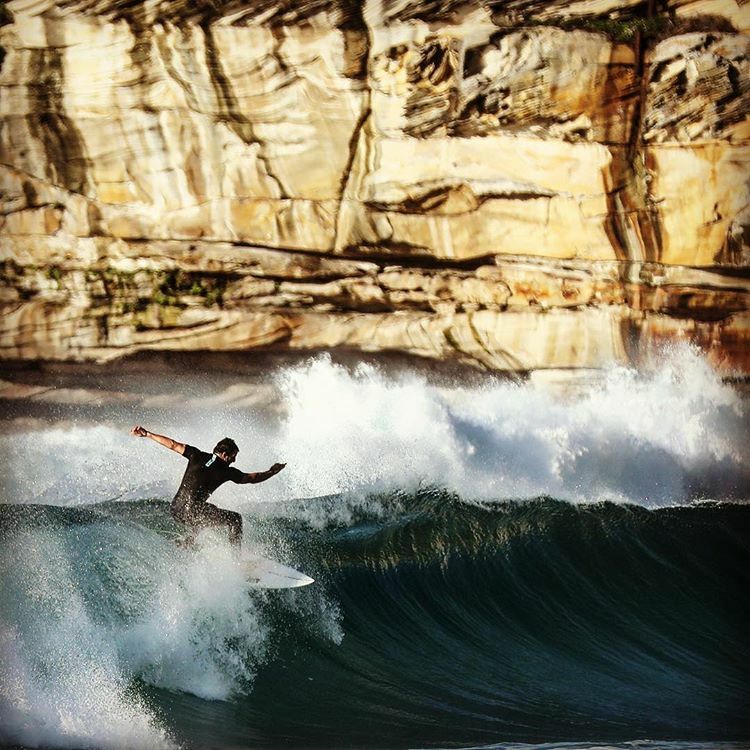 Surf culture is considered a defining feature that separates Sydney from other metropolitan areas like Melbourne, so it’s only fitting that your first day be spent on the sand. A trip to Bondi beach, the quintessential spot to get some sun and waves, is not only a fun way to shake off that jet lag, but also a flexible option that doesn’t depend on your arrival time. A popular option of transport is the 333 bus from either Bondi Junction station or Circular Quay. It’s an express bus that leaves regularly so you don’t have to worry about exact time. The stop to get off is conveniently named Bondi, located on Campbell Parade. 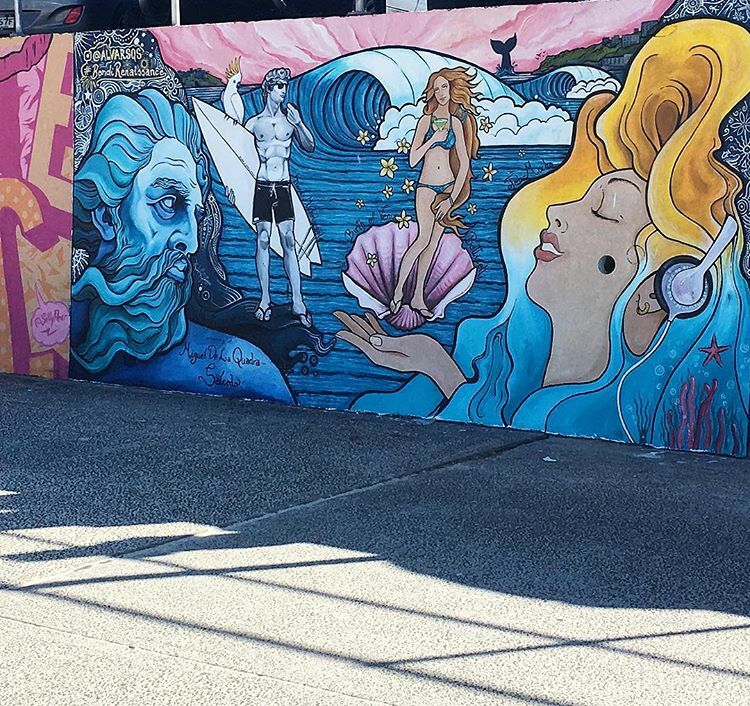 Once you cross the street, you will find yourself at the southern corner of Bondi. A walk down Notts Avenue, with incredible view of the bay curve, will take you to the landmark Bondi Iceberg. 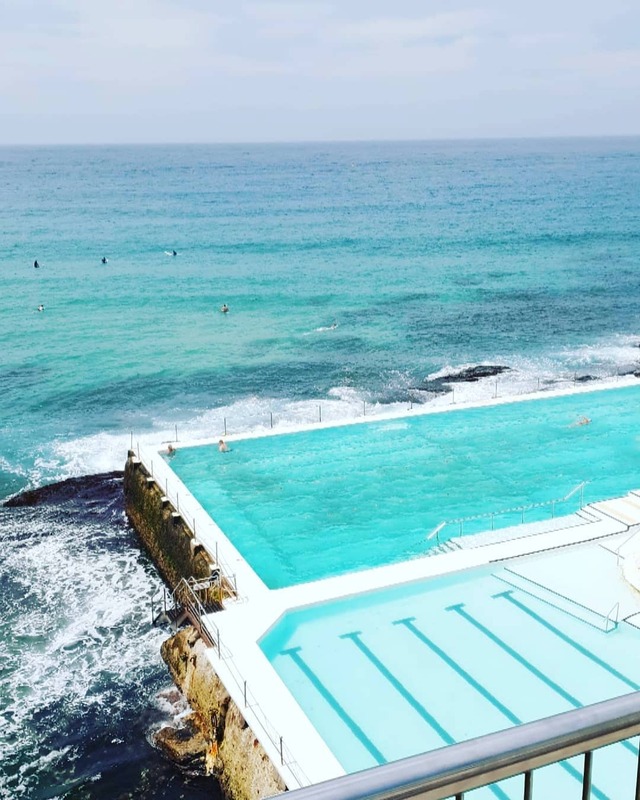 It is home to the 50-meter-long ocean pool called the Bondi baths, a beautiful and instagram friendly stop. Take a dip in the pool, which was built in 1929, home to the Bondi Iceberg winter swimming club. The Crabbe Hole cafe is available to cure your munchies, and there are also hot showers and a sauna available for those who want to skip the pool or opt out of the sea. 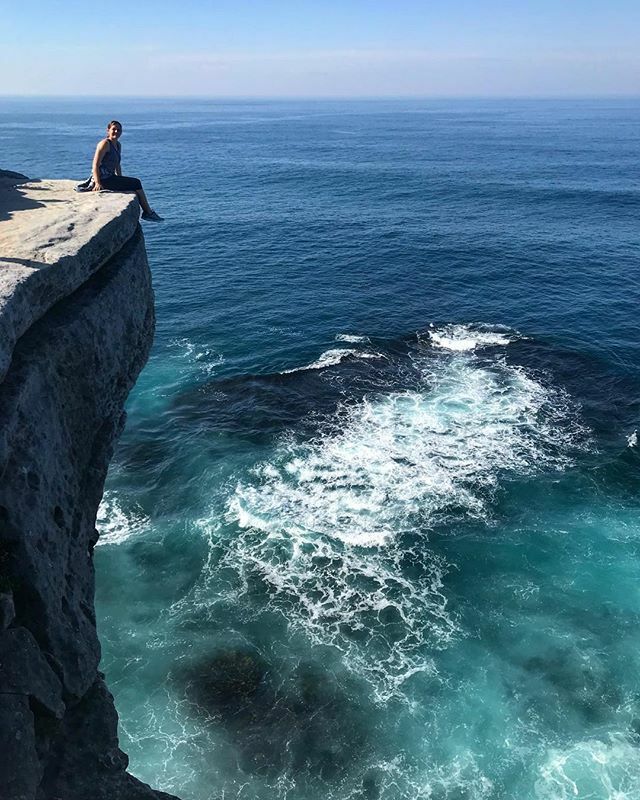 The most popular coastal walk in Sydney offers an abundance of ocean views, towering sandstone cliffs and crashing waves as far as the eyes can see. With Sydney beach culture present at every turn of this 6km walk, the walk will anywhere from 2.5 to 3 hours comfortably paced, but you can choose how far to walk depending on your schedule. 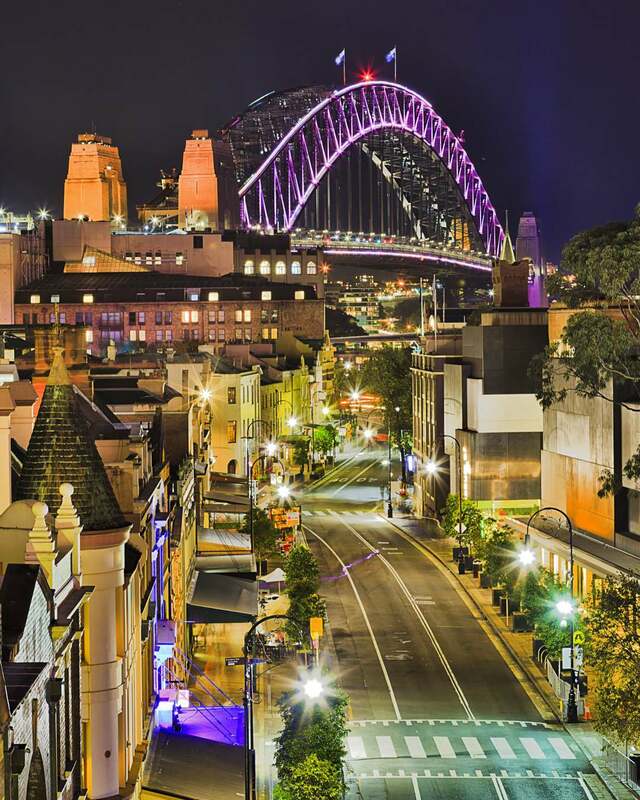 Even the first 100 meters will take your breath away with its million dollars view, so take your time enjoying one of the must-see site of Sydney. Around a rocky cove and up a cliffside. 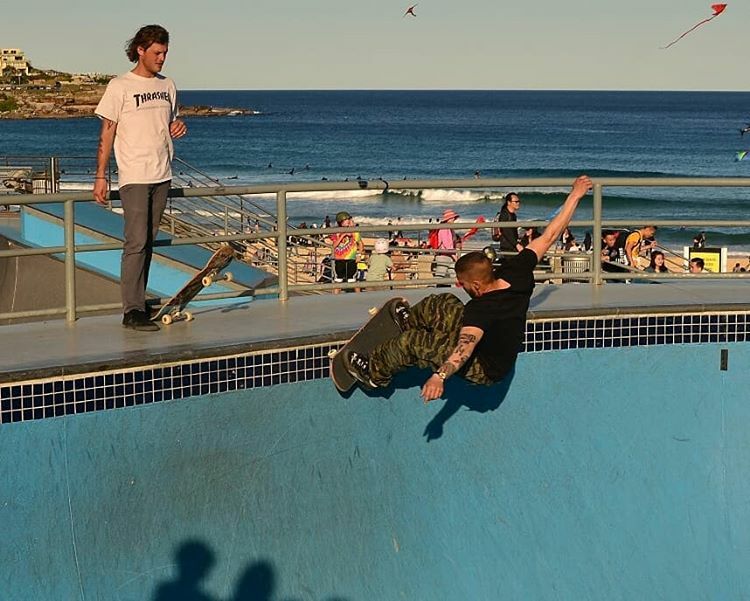 Find your way to Bondi promenade, where you can find the Pacific Ocean sparkling on one side, and skate parks on the other. Skate with the ocean breeze on your back. You can also take pictures with the long stretch of murals. The options are endless when it comes to filling your stomach. Some of the recommended spots are The Well, The Shack, Harry’s, and Depot, but almost everywhere you go there are healthy, delicious and beautiful meals waiting for you. Just don’t go overboard; there’s still an afternoon in the water. Head down to the beach for an afternoon adventure: learning to surf. You’ll start out with spotting waves, paddling, then standing up on your board (dry on the sand if you’re just starting out). Once you get the hang of it, into the shallow waves you’ll go. Master that and you’ll graduate on to the green waves beyond the break and be able to enjoy a view taken out of every climax in every surfing movie ever. There’s nothing like riding the waves on a longboard with the sun on your back. 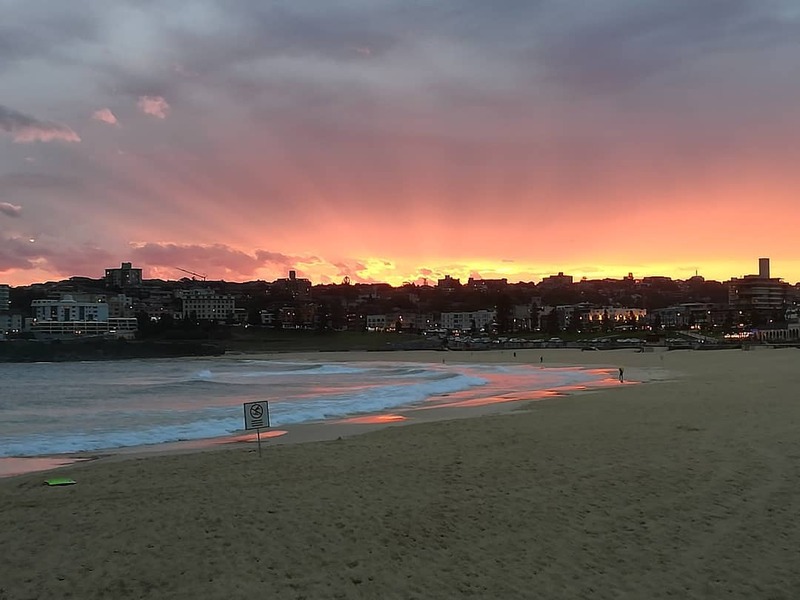 You can laze around on the sand to wait for yet another stunner of Bondi, the dramatic sunset. Beyond this point, you can experience bondi nightlife with a slight chance of celebrity spotting. Some recommended activities include grabbing some frozen margarita Beach Burrito, tasting some fine wine at Porch Parlour, or enjoying the pumping scene at The Bucket List. All you need to remember is that the 333 bus leaves from North Bondi bus station, which is up the hill. If you want a guarantee a seat, it is advisable to take the short trip there. The best place to kick off your second day is at the Circular Quay. After seeing so many photos of this iconic spot, the feeling of awe when you see the landmarks for the first time in person will still have enough of a punch to jolt you right awake. Circular Quay with Sydney’s 2 landmarks on either side. The Circular Quay offers the sight of both of Sydney’s symbolic structure, the Sydney Opera House and Sydney Harbour Bridge. It is the best spot to take the obligatory “hey I’m in Australia” photo. Take a touristy photo, or ten. 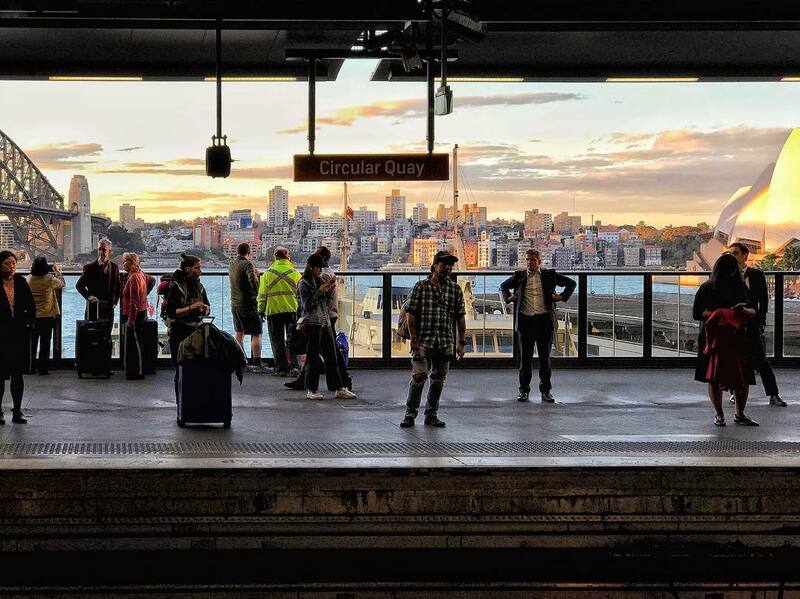 As one of the most bustling transport hubs of Sydney, Circular Quay is lined with numerous cafes and restaurants, a useful piece of information for those who skipped breakfast at their hotel. You can also make time to visit some interesting spots nearby, including the Custom House and the Museum of Contemporary Arts. You can access the Royal Botanic Garden from the east side of the Opera House. The impressive location of the garden alone laces it among the top posts for best gardens in the world. Wander around the garden to admire its collection of flora with the harbour in the background. For the artsy kind, there’s also the Art Gallery of New South Wales, which boast 5 levels of art collection, with anything from Australian, Aboriginal, European, to Asian and contemporary art. For a budget-friendly option, consider a picnic right within the Botanic Garden. Bring some takeaway from the harbour, pop open a bottle of wine, pick a random spot, preferably with a view, and you have yourself a cheap lunch that is also an experience in itself. Mrs. Macquarie’s Chair is a spot within the garden that offers a beautiful vantage point of the harbour. Tip: the sunset from this spot is also divine. Now that you are recharged, it’s time to get your legs working again. There’s two ways to cross the bridge. One option is to climb over, a once in a lifetime magical moment but something you would need to book in advance, as it is very popular. 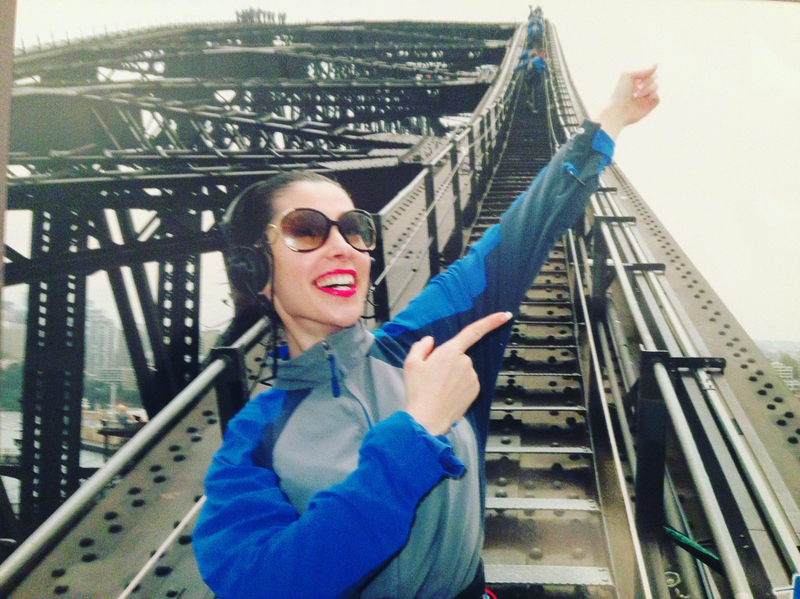 Sydney Harbour Bridge Climb is not cheap but definitely worth every penny. 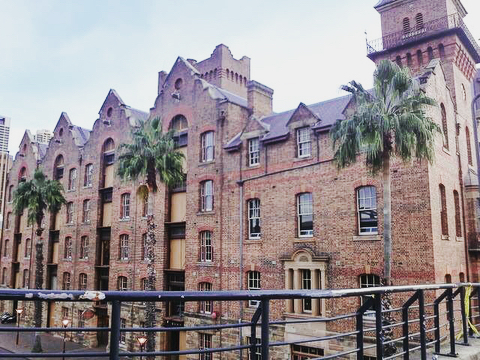 The Rocks District is a historic area near Circular Quay that is packed full of pristinely preserved architecture and beautiful cobblestone street. There’s a story on every corner you walk. The Rocks Discovery Museum have three floors about the history of the area and of those who lived here during the early days of white Australia. Feeling thirsty from all that walking? Look no further. We recommend the Observer Hotel for a pint and some live music, or Harts Pub for quality hand crafted beers. The old historic Rock District and the new Harbour bridge on the back ground. You’ve had a long day of exploring. Now it’s time to kick back and enjoy a good meal. You can either stay at the Rocks or back to the Quay. In the Rocks, there’s kangaroo, emu, and crocodile pizza waiting for you at the Australian heritage hotel. A walk back to the Quay will give you the opportunity to dine at the Opera Bar, ending your second day with a cold beer and an uninterrupted view of sunset on the bay. 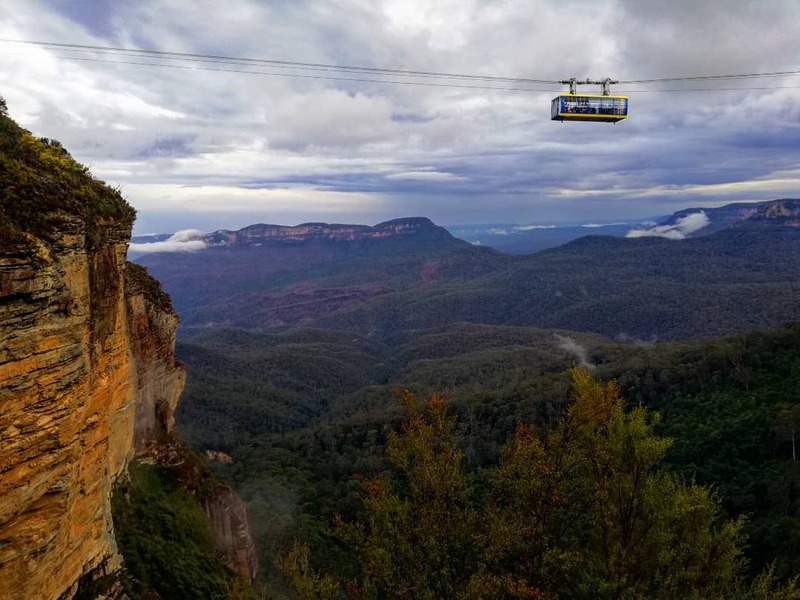 A trip to the Blue Mountains, a sweeping mountain range with magnificent view amongst the blue haze, is by far the most popular day trip from Sydney. Having spent the last 2 days near the sea, you can use a change in landscape; and an adventure the mountains is exactly what you need. Just don’t forget the bring a jacket, the temperature as you climb the is noticeably lower than at the city. 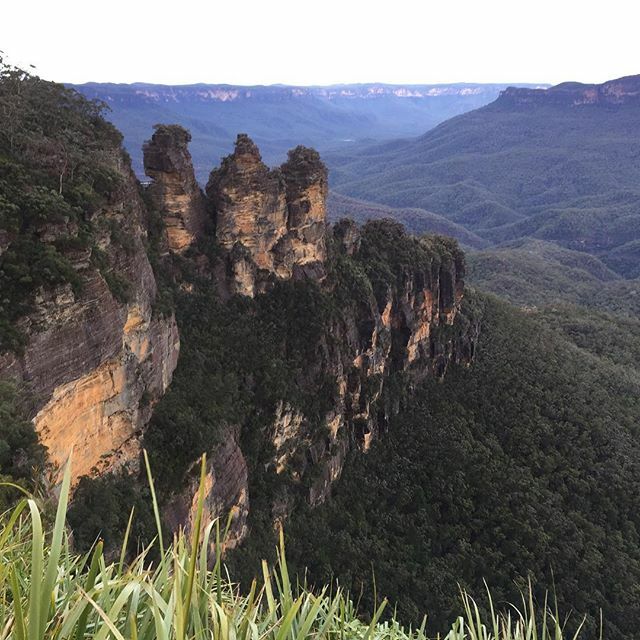 Read our detailed guide to a day trip to the Blue Mountains to have the most fulfilling experience! The trip to Blue Mountains take about 2 hours one way so it’s advisable that you start early. Head towards Central station from your hotel, then change train for Katoomba. Pack some breakfast to enjoy on the train, kick back, relax, and enjoy the view of Aussie countryside passing by your window. Once you arrive, head south down Katoomba Street and check out the little art galleries and old-world shops playing music from a bygone era. 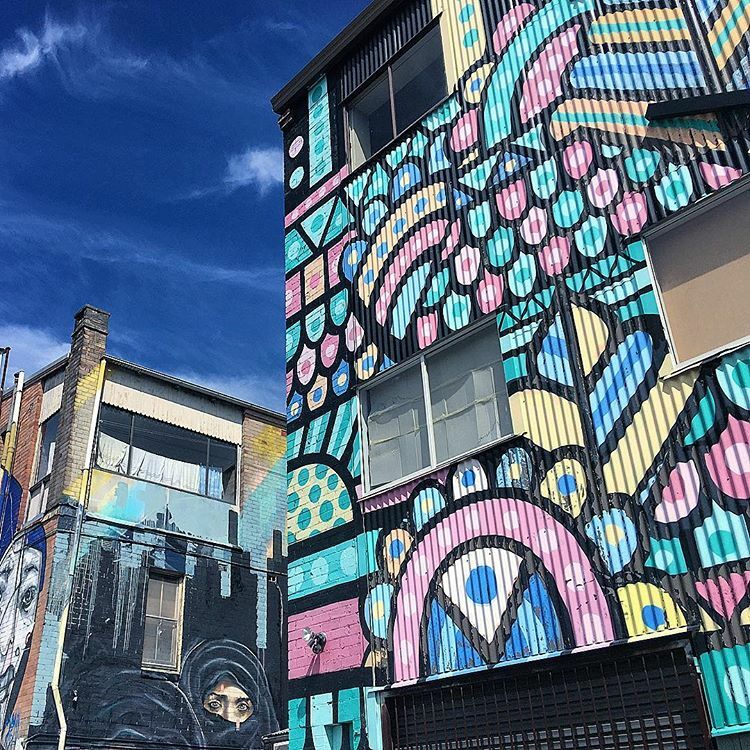 If you need your daily dose of caffeine then stop for a coffee at the cosy Yellow Deli Café, don’t forget to take a left down Waratah St to marvel at the colourful street art along Beverly Place. Along with Newtown in Sydney, this is our favorite street art site. Hop on the 686 bus on Waratah Street, which will take you to Echo Point, where you’ll find a visitors’ centre and a lookout to the very famous Three Sisters rock formation, which according to Aboriginal legend represents (spoiler alert!) three sisters turned into stone. The Three Sisters amidst the signature blue haze. Keep in mind that tourist buses flock to Echo points so it gets very busy here. You may even find yourself getting poked in the eye by selfie sticks! You can also visit Lilianfels park just nearby to have a picnic lunch, or take a trip down to the Three sisters and stand inside one of them. Descend into the valley via the Giant Stairway, close to 100 steel and stone steps that date back to 1909. Work out with a view. 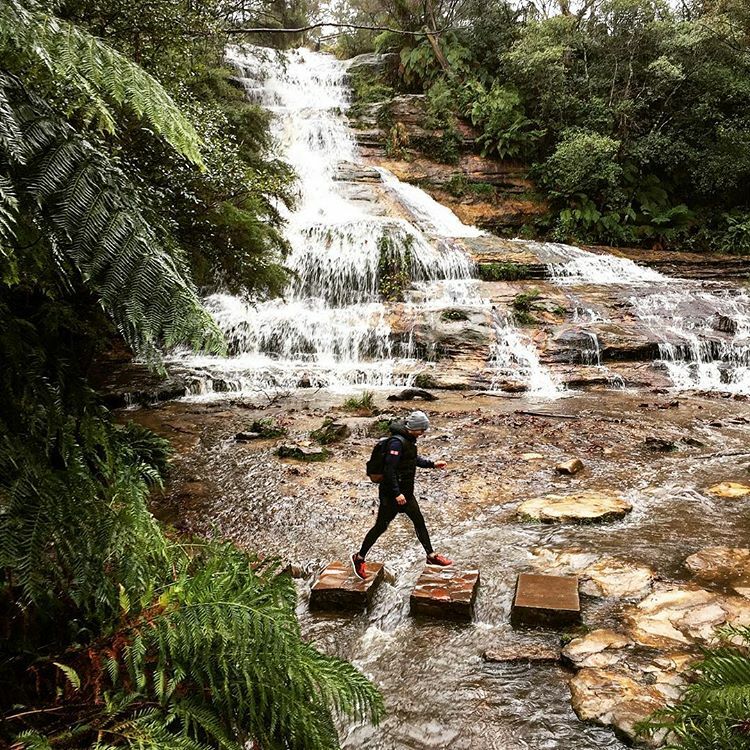 Walk along the Federal Pass to Katoomba Falls, then arrive at Scenic World. Remember to take water and a hat; the walk is fairly challenging and takes two to three hours. Katoomba means “shiny falling waterfall”, the namesake of this spot. In operation since 1958, the Scenic Skyway is a 720m return ride between clifftops in a cable car, suspended 270m in the air. Rebuilt in 2005, the new cable car features a glass bottom for unrestricted views of the rainforest below. The journey provides the best views of Katoomba Falls, the Three Sisters, and Jamison Valley stretching to the horizon. Alternatively, you can take the Scenic Railway, aka the steepest railway in the world. The ride passes down a 52° incline through a rock tunnel down into the Jamison Valley to the rainforest below. These days, just to get you into the mood, they play the Indiana Jones theme while you descend at a rate of four metres per second. 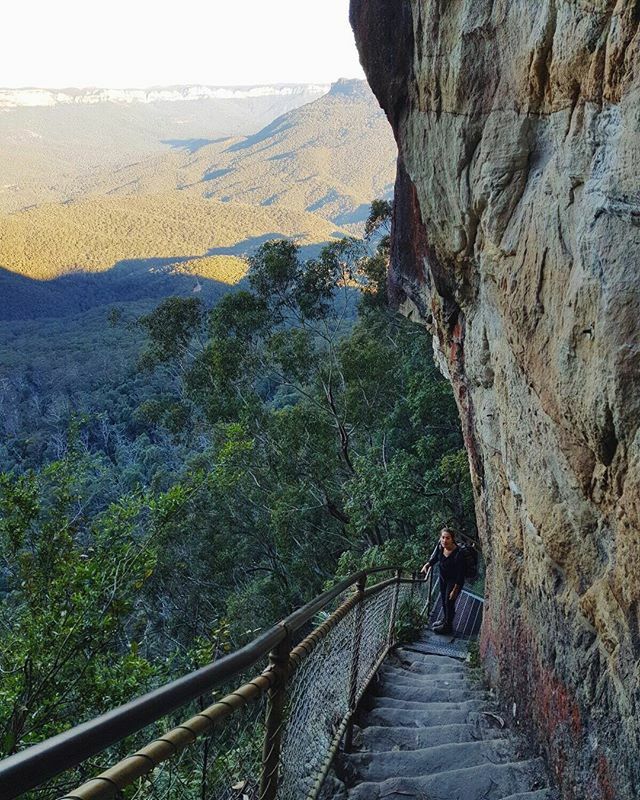 Make your way back to Echo point then the 686 bus to Katoomba station. From here, you can take a 3 minute Train ride to Leura, a beautiful village with filled with artsy boutique and affordable restaurant. You can try some Blue Mountain wine while you’re here. Otherwise, you can catch a train back to Sydney and explore some more, since 3 days are hardly enough to even scratch the surface of one of the best cities in the world.